Edge banding should be applied to all exposed areas of plywood before assembly. Cut the pieces for the legs, side frames, and side panels. Set the Kreg jig for 1-1/2” material and drill pocket holes in each end of the frame pieces, as well as the top end of the legs. Set the Kreg jig for ¾” material and drill pocket holes in the plywood panel as shown. Attach the panel to the side frame pieces using glue and 1-1/4” pocket hole screws. Attach the side panel assembly as shown to the legs using glue and pocket hole screws. Use 2” pocket hole screws through the frame pieces into the legs and use 1-1/4” pocket hole screws through the side panels into the legs. Cut the pieces for the Bottom aprons. Drill pocket holes in each end and attach to the legs using glue and 1-1/4” pocket hole screws. Cut the piece for the back. Drill pocket hole screws as shown. Attach to the legs and the back apron using glue and 1-1/4” pocket hole screws. Cut the piece for the bottom. Drill pocket holes as shown and attach to the bottom aprons using glue and 1-1/4” pocket hole screws. The face of the shelf should be flush with the top of the aprons. Cut the pieces for the bottom supports. Attach to the aprons using glue and 1-1/4” pocket hole screws. The supports should fit up against the back side of the bottom. Cut the pieces for the dividers. Cut the notch as shown using a jigsaw. 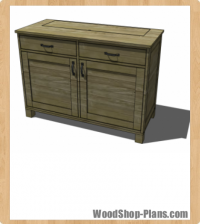 When drilling pocket holes, note that there will be a left and a right so that the pocket holes are hidden in the section where the drawers are located. Cut the piece for the top apron. Drill pocket holes at each end and attach to the cabinet using glue and 1-1/4” pocket hole screws. Cut the pieces for the shelves. Drill pocket holes at the sides and back, then attach to the cabinet as shown using glue and 1-1/4” pocket hole screws. Cut the pieces for the drawer dividers. Drill pocket holes at the sides and back also and attach to the cabinet using glue and 1-1/4” pocket hole screws. Cut the piece for the top. Attach using glue and pocket hole screws through the legs and back into the top piece. Use 1-1/2” pocket hole screws through the legs and 1-1/4” pocket hole screws through the back. Cut the pieces for the door frames. Drill pocket holes in the shorter pieces as well as the piece for the panel. Attach the panels to the shorter pieces using glue and 1-1/4” pocket hole screws, then attach the assembly to the longer frame pieces using glue and 1-1/4” pocket hole screws. Cut the pieces for the drawer boxes. Assemble as shown using glue and 1-1/4” pocket hole screws. 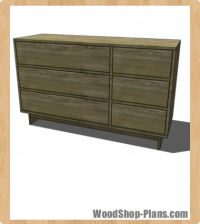 Attach the drawer slide hardware according to the manufacturer’s instructions. Make any necessary adjustments. For an easy tutorial on how to do this, click here. Cut the pieces for the drawer fronts. The fronts will overlap the opening by ¼” on each side. 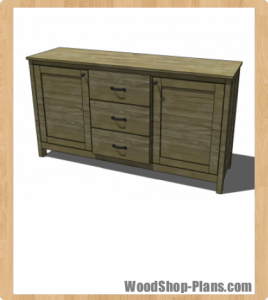 For an easy tutorial on how to attach drawer fronts, click here.